Most of the township of Caton is hilly, the land sloping north from Clougha Pike and Ward’s Stone, 1836 ft above sea level, to the wooded valley of Artle Beck, then rising again to Caton Moor, at about 1000ft, then descending to the Lune. By the riverside is a level tract of land where the village is situated with the church at Brookhouse a mile and a half to the east and the hamlet of Caton Green still further east on higher ground. The village of Brookhouse, containing Caton church, is in fact the original village of Caton, the present village of Caton being fairly modern. The hillside district south of Artle Beck is called Littledale. The main road running through the township is that from Lancaster to Hornby, the same road which runs through Claughton. Another road runs nearly parallel to the main road, but on higher ground, and passes through Brookhouse and past the church and Caton Green to Claughton. William Crofte died in 1606 holding twelve messuages, land etc. in Caton. He had, in 1602, settled his manor of Caton with Littlefield, Deep Clough and Tongue Moor, lately purchased from Lord Mounteagle, on his new wife Mary and his issue by her. This transpired to be a daughter, Mary, born in 1604. William’s daughter Mary married first William Lascelles of Brackenbury, and later John Leyburne of Cunswick. In 1630 Sir Henry Compton purchased the moiety of Caton from John Leyburne and Mary, the manor thus leaving Croft ownership. As a point of interest, Sir Henry Compton was a Royalist and recusant, and had his estates, including Caton, sequestered in the Civil War, for which he compounded. The parish records for St. Paul’s church in Caton begin in 1585, but no Crofts appear until 1596 when William Crofte bought his part of the manor. Most probably members of the Croft family were baptised, married and buried in Claughton Church until this point. (It’s a shame that parish records for Claughton do not begin until 1701, previous records having not survived, as details of baptisms etc. cannot therefore be verified as previously mentioned.) Many members of the Croft family were buried “in Ecclesia” or, in other words, within the church at Caton. This may have meant that they had a family vault, confirming them to be an important family in the area. Unfortunately, along with many other ancient churches, St. Paul’s was completely rebuilt in Victorian times (1865), only the ancient tower surviving. All traces of any Croft graves or monuments were destroyed. The first member of the Croft family to appear in the baptism records at Caton is Nicholas Croft, son of Mr. Edward Croft, in 1596. Edward Croft was lord of the manor of Claughton at this time, and brother of William Croft who had purchased the manor of Caton from Lord Mounteagle around this time, so it is fitting that he should be the first member of the Croft family to use the church for baptism. No other Crofts were baptised there until 13 years later in 1609, although two burials of children (of Henry Croft) occured in 1589 and 1592, indicating that members of the family were already living in Caton before William purchased the manor. From 1609 there are regular entries in the Caton registers, suggesting that the members of the family living in this area had stopped using Claughton church in favour of Caton. The member of the family who was baptising children here in the early part of the 17th century was Gabriell Crofte (and his wife, Ellin). They had around ten children in Caton. It is highly likely that this Gabriell and Henry (previously mentioned) were brothers, as in Henry’s will of 1623 there is a mention of “his brother Gabriel”. It is impossible to be certain about the identity of their father as they would have been baptised around 1570, either at Caton before records had begun to be kept, or at Claughton church and therefore in the ‘lost’ records of St. Chad’s. What is certain however, is that they were members of a branch of the Croft family of Claughton; hence the traditional family use of Henry and Gabriell as Christian names. The marriages of neither Henry nor Gabriel appear in the Caton church records, so it is a fair assumption that they both married at Claughton. Henry did not use Caton church to baptise his children, so again we can assume that he used Claughton, and even Gabriell’s first child, also named Henry and born around 1600, was not baptised at Caton (presumably at Claughton again). As the family was resolutely Roman Catholic during this period, it is also possible that Caton church was shunned in favour of Robert Hall Catholic Mission (about 10 miles away). As the Croft family had their own chapel at Claughton however, I feel it is more likely that this would have been used. Incidentally, it was around this time when the letter ‘e’ began to be dropped from the name Crofte, increasingly becoming ‘Croft.’ Henry died in 1623, and his brother Gabriell died in 1636. Both were buried within the church, suggesting that the family had a high standing in the area. Gabriell’s will describes him as being “of Tongmoor”. Tongmoor (Tonguemoor) was the name of the house/farm where Gabriel and his family lived, and was situated in the hamlet of Littledale, about 2 miles from Caton. Of the 10 children that I know to have been Gabriell’s, a combination of Parish Register entries and wills describes most of them as being either “of Littledale” or “of Tongmoor”. 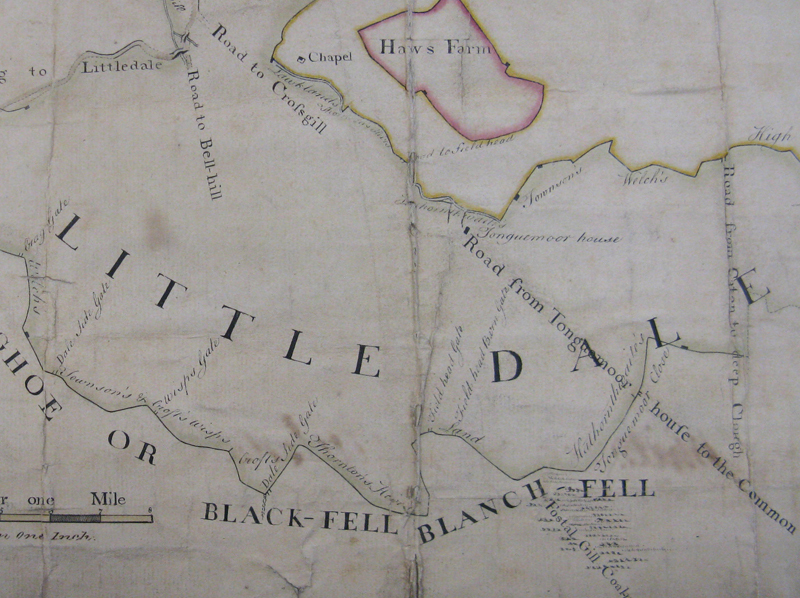 Two things can be deduced from the Caton church records regarding the Crofts of Littledale. The first is that as every Croft entry in the records can ultimately be traced back to Gabriel, it is clear that he and his brother Henry were the only two members of the Croft family in the area during the early 1600’s. It is also certain that these two brothers came to Caton (Littledale) as adults, and were therefore the first generation of Crofts to inhabit the area. This must be the case, since if the family had been in the area before this, there would some Croft entries in the Caton parish records not attributable to Gabriell, but to another brother, uncle etc. It is likely that Henry was eldest son and Gabriell was the second son, as this was the family tradition of naming, and they were probably born in one of the nearby villages inhabited by the Croft family in the 16th century. Hornby or Farleton are the most likely, as they are close to both Claughton and Caton/Littledale, and there is documentary evidence of Crofts living in both these places in the second half of the 16th century. I currently have no proof of Gabriell’s origin however, but maybe at some point evidence will come to light! It is also worth noting that Tonguemoor House was a large, historic house, which supports the supposition that Gabriell was not far removed from the Crofts of Claughton Hall. 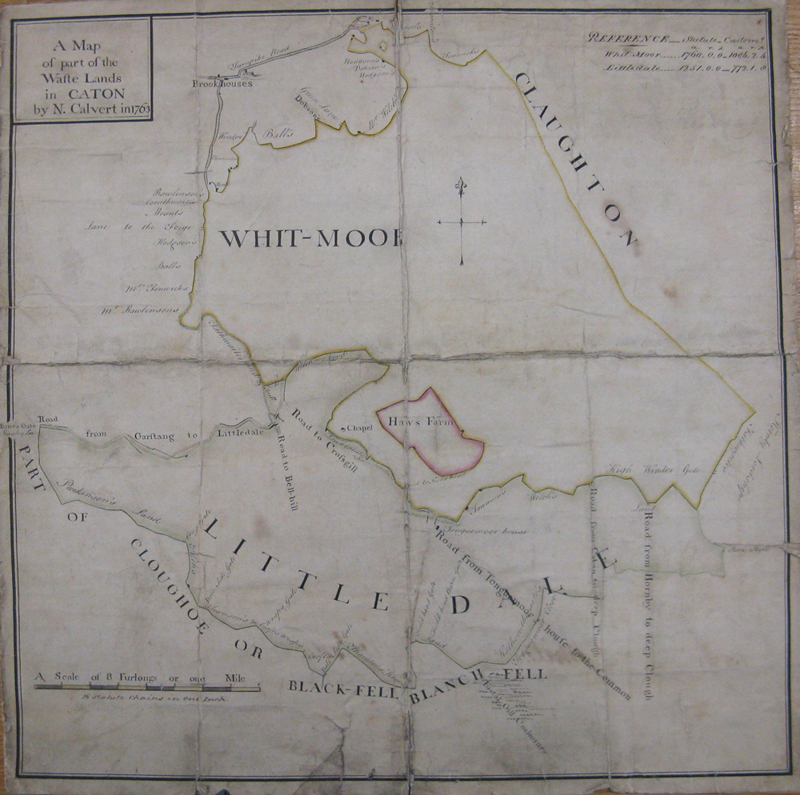 Also, It seems that Tonguemoor was actually owned by William Croft of Claughton Hall, as in 1602 William made a settlement of all his lands in "Caton, Littlefield (Littledale), Deep Clough and Tongue Moor" on his new wife and his issue by her. Particular mention is made of William’s lands in and around Caton, which he had inherited when the estates were divided between himself and his brother Edward in 1587. This suggests that the Crofts of Claughton Hall owned much of Littledale, including Tonguemoor, so it would seem that Gabriell was a tenant at Tonguemoor, his landlord being his cousin from the big Hall! Regarding the Crofts in Littledale, the family begun by Gabriell in the early 1600’s continued in this area for at least 5 more generations, until the mid 1700s, after which the family is dispersed to the surrounding villages. Tonguemoor itself remained in the family until at least about the year 1700, which is the last document I have found which refers to a member of the Croft family as being “of Tonguemoor”. It is likely that the family also had other property and land in Littledale at the same time. Those members of the family which are described in parish registers and wills as being “of Littledale” may well have lived at Tonguemoor, but it is more likely that they lived elsewhere within the hamlet. As the family grew with each generation, it is hardly likely that they all continued to live in the same house; it would have been very crowded! 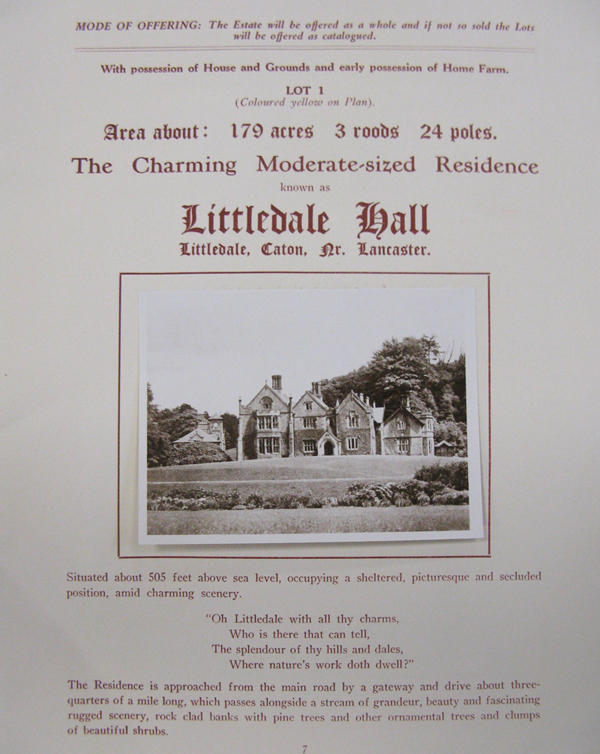 It should be noted that Littledale was a rural community, with no village centre, and consisted of only a handful of farms, as is still the case today. So by the late 1600s, it is possible that members of the Croft family were a prominent family in Littledale, occupying several farms. Tonguemoor House was a very ancient and historic building, dating back to at least the 15th century, and possibly much earlier. Sadly, I have been unable to find any photographs or drawings of the house, which was demolished in the 1970’s to make way for a new building. I have however found quite a few references to it on documents and maps from the 17th, 18th and 19th centuries. 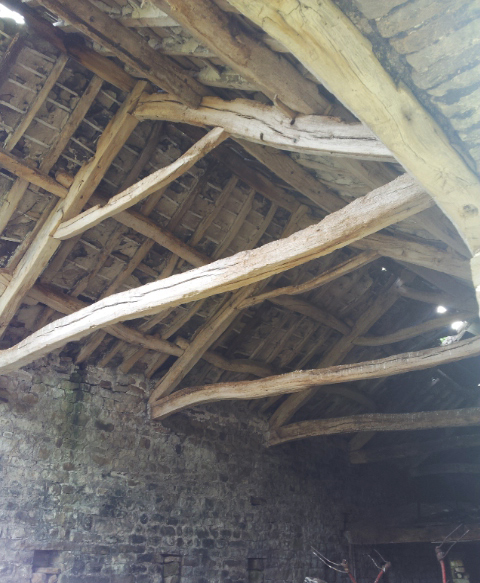 Tonguemoor House stood in a prominent position in the Littledale valley, and consisted of the main house, large barn and another building attached to a large walled garden, typical of a Tudor/Elizabethan dwelling. This layout can clearly be seen on OS map of Littledale dated 1844-45, and on a later OS map dated 1895, the same buildings are evident, now situated next to the recently built Littledale Hall. Littledale Hall was built next to Tonguemoor by Rev. John Dodson. He was the vicar of Cockerham until 1849, and on retirement moved into Tonguemoor. In the 1851 census he is living with his family and servants at Tonguemoor, and is described as “Landed Proprietor.” He had Littledale Hall built in the mid 1850’s, and in the 1861 census he is resident at his new Hall, with Tonguemoor now occupied by servants and their families. John Dodson died in 1890, and Littledale Hall and Estate passed to William Priestley, a Bradford businessman. As can be seen from the photograph above, Littledale Hall is a handsome Gothic style Building, typical of the Victorian period. Tonguemoor is situated just behind and to the left of the Hall, sadly not photographed for the sale. Henry Crofte, eldest son of Gabriell, “Yeoman of Littledale”, married twice (both times in Caton church). By his first wife, Elizabeth Walker, who he married in 1621, he had two sons, William (1622) and Lawrence (1629). Henry married again in 1638 to Ellin Foxcrofte (a widow), and had four more children, Ellinor (1641), Gabriell (1642), Robert (1646) and William (1649). We must assume that his first wife, Elizabeth, had died at some time previous to this, although there is no burial record in Caton. My own family line descends from Henry’s second son, Lawrence. There is no further trace of him in the Caton records other than his baptism, but he reappears some years later as an adult in the village of Whittle-le-Woods, near Leyland, some 25 miles south of his birthplace. Elizabeth, Gabriell’s eldest daughter - no records other than her baptism have come to light. Robert, Gabriell’s second son, married Helen, and died in 1675. Thomas, his third son, married Alice (surname unknown), and it would seem continued to live and farm at Tonguemoor, as the burial records of both him and his wife refer to them as being “of Tonguemoor”, and in his will of 1686 he is described as “Husbandman” “of Tonguemoor”. As far as I can tell, they only had one child, also named Thomas, born in 1642. He married Alice Hynd in 1673, and continued to live and farm at Tonguemoor until his death in 1686 (he and his father died within a few weeks of each other, perhaps of the same illness). His offspring (three daughters and one son) were the last members of the Croft family to live at Tonguemoor, as there is no further mention of Crofts there after about 1700. Sadly, although Tonguemoor survived until the 1970’s, it was then demolished, and very little now remains; the large walled garden and attached building being the only survivors. Mary, Gabriell’s next child, married and became Mary Coulston. Ann, his next daughter, died in 1694 at the age of 74. She is described in her will as “spinster of Haylat”. Haylat (aka Haylot) was, and still is, a farm on the edge of Littledale, on the border of Roeburndale. Margaret, his next daughter, married and became Margaret Jackson, and his youngest daughter Ellinor married and became Ellinor Clarke. Gabriel, his fourth son, married Jane (surname unknown), but it seems he died childless at the age of 46. In his will of 1671, he is also described as “Husbandman of Tonguemoor”, so it seems that he shared the farm with his elder brother Thomas. William, Gabriell’s fifth son, married Dorothy Foxcrofte in 1654. Once married he left Tonguemoor, but remained in Littledale. He is described in one document (dated 1668 when he would have been aged 40) as “William Crofte of Littledale, Webster”. So it would seem that he and his wife were not farmers but weavers. Several more documents refer to William and Dorothy buying and selling property and land in Littledale; in particular a messuage and tenement called Lamb Close, a messuage and tenement called Broadwoodhead, two closes called Cowe Hill and Lower Close and a deal involving 1 messuage, 1 barn, 1 stable, 2 gardens, 10 acres of land, 4 acres of meadow and 10 acres of pasture in Littledale. It seems that William had become quite successful! It may be that William had married wisely, as Dorothy’s father and brother also owned properties and land in the same area. However, this could also be pure coincidence, as Littledale is a very small place. William and Dorothy had eight children that I know of, two sons and six daughters, born between 1654 and 1673. The only one which I know the fate of is his eldest son, Thomas. He married Margaret (surname unknown), remained in Littledale and had a family of two sons and daughters (William, Anne, Henry and another Ann - the first one having died as an infant). In 1758, the will of William Croft (son of Thomas) describes him as being “of Daleside”, which is a neighbouring farm to Tonguemoor. This William, and his wife Elizabeth (Walmesley) had a family of their own at Daleside - Thomas, Margaret and John. On William's death in 1758, Daleside was bequeathed to his younger son John, his eldest son relocating to Hornby. John remained at Daleside until his death in 1775, after which the farm must have been sold, as by 1786 it was occupied by John Townson, and there is no further mention of the Crofts there after this time. On a map dating from 1763, Tonguemoor House is clearly marked, and is obviously the most predominant building in Littledale, as it is the only dwelling actually marked on the map. South West of Tonguemoor, on the border with the fell, the phrases “Townson’s & Croft’s Wisps” and “Crofts” can be seen. This is the position of Daleside farm and it’s land. 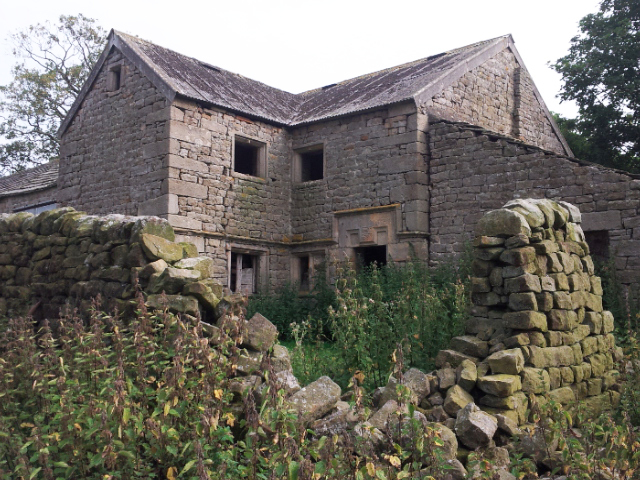 Daleside farm itself is still standing, but has been unoccupied for many years, and is now in a poor state of repair. Unfortunately, as with many other properties, it is now owned by the Estate of the Duke of Westminster, and is thus unavailable to be bought and renovated. The likelihood is that, as with many other buildings on these vast estates, it will be allowed to gradually fall down. Daleside Farm Doorway, showing datestone "RT 1685"
As previously mentioned, the various branches of the Littledale Croft Family gradually dispersed during the second half of the 18th century, some going to Melling and Hornby (just beyond Claughton), while some continued hill farming and moved from Littledale towards Wray and Roeburndale, living at Park House, Haylot , Deepclough, Smeer Hall and Craggs at various times during the late 18th and 19th century. These branches can be traced via the census returns, and descendants of this Littledale family spread throughout the Lune Valley to Kirkby Lonsdale, Warton, Silverdale and Borwick.